Hair. It’s just everywhere and managing it can be a chore. 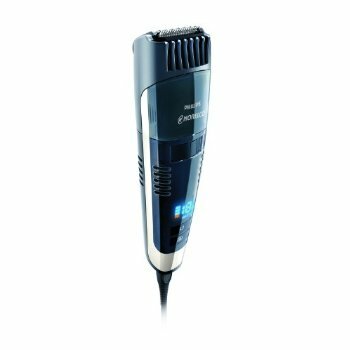 For men who maintain facial hair having a quality trimmer is a must. That’s where the Philips Norelco Qt4070 Turbo Vacuum Beard, Stubble, and Mustache Trimmer Pro comes in with flying colors. Well, only two colors, a nice shiny black and silver. It’s certainly more expensive than other trimmers but this one is packed with exciting and useful features. – Extensive flexibility with 18 length settings from 1 mm to 18 mm, with a 0.5 mm setting for stubble. – Stainless steel self sharpening blades. – Maintain free, needing no oil. – Multifunctional display showing battery status and hair length. – A travel lock mechanism to prevent accidental adjustment of length while in transit. These features are designed to make this trimmer the only one you’ll ever need and to some extent this is accomplished. However, some of these features can hinder it’s use. This bulky trimmer may make it difficult to get that really close trim as the hair collection container obscures the view in a mirror. A common issue to look out for when purchasing a new trimmer is blade guards. These adjustable blade guards are a safety measure but in the Philips Norelco Qt4070 Turbo Vacuum trimmer these guards create a separation in the blades. This separation is a recipe for an inconsistent trim, especially in areas of the face with strong lines and curves like the jaw or cheeks. With reliability a possible concern, overall this trimmer’s features still put it above the average machine and with that so goes its price. There are certainly cheaper options but, for the style minded, bearded or mustachioed man (or woman), the Qt4070 is a prime choice. Convenience of use make it a desirable selection for the regular user concerned with maintaining a look. Users who may not trim on any sort of regular basis or just have simple demands should look at the cost benefit analysis. The Qt4070 is not the most expensive trimmer out on the market but, cheaper brands and models are in all likelihood a better choice for the causal trimmer.